After finishing AC XII ranked 5th, the pirates look to be in good shape and in good spirits. They have been busy giving interviews, talking about lifting the cup this year. A rival team member, on conditions of anonymity, said, "This is all talk and no show. For a team as inconsistent as them, I wouldn't be surprised if they end up on the bottom rung. Also, have you seen them on the fields at all? They are everywhere but there. I wouldn't bet my money on them." Being a Top 4 powerhouse. They have lots of rivals. They became the First Place champions of Altador Cup IV. Their strength is in Yooyuball. "Dasher" Soley not seeming to retire after claiming he would for about four years! When they were swept by Team Kreludor in Altador Cup IV! They are known conventionally as "pirates". Despite the rivalry between themselves and Shenkuu... an interesting alliance has sprung up on the Neoboards in the form of "Ninja Pirates" or "Pirate Ninjas" (team supporters who have allegances to both). They are marked as the next victims of the "Winner's Curse" (ACIV). They became victims of the "Winner's Curse" in ACV, falling into the bottom of the second bracket in the league table. In ACVI Dasher finally retired to be replaced by Feldon "Dinksy" Collibridge. The ol' Krawk was missed by fans. In ACVI Team Krawk Island made a huge comeback by taking Second Place! Below you can see how well Team Krawk Island has performed in the previous Altador Cups. 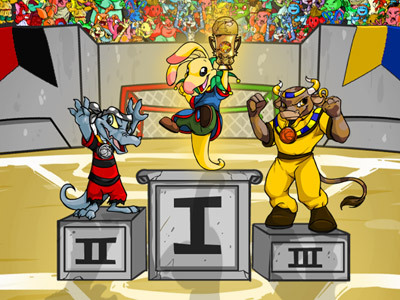 In Altador Cup III, Krawk Island took home the Silver award. A might fine day for buccaneers all over Neopia! Will Krawk Island escape the feared "Winner's Curse" after taking home the Gold Trophy in ACIV? In ACVI the Krawkstars rose up again to take Silver! Like with overall team awards, no additional individual player awards were awarded to any team after Altador Cup III, with the exception of Most Valuable Player, which was awarded to the team captain of the winning team in Altador Cups IV and V.